This work is licensed under a Creative Commons Attribution-NonCommercial-ShareAlike 3.0 Unported License. Note: This story is set in a fictional version of Walt Disney World Resort, and all referenced material is used in like fashion. The Walt Disney Company has not authorized or endorsed this story. Meanwhile, Oswald was telling Johnny the story behind that studios himself. Oswald held out his hand, but Johnny held out a fist. Actual Question Marks appeared over Oswald’s head. “Heh, I learn something new every day,” Oswald said. “Good thing for you ya got me as a guide,” Johnny said. Amber walked out of the dressing room before her mouse friend and returned rabbit, all decked out in a modified Mouseketeer outfit, her name in bold letters over an electric blue skirt, light blue socks—which go up to Grade A Zettai Ryouiki levels—and shiny black shoes, plus a bow in her hair. Johnny always had a smile for that outfit. In mid spin, she snatched a vest to slip on over the shirt. There was a patch where someone could put on a “Mickey Mouse Club” insignia, but Ozzy found that the vest was reversible as well as had a patch on each: One side had an embroidered patch with Johnny on it. But the side Amber showed had a Team Oswald Patch, which had the Rabbit instead of Mickey on the insignia. He then turned back to Amber. “It’s the hairstyle,” Amber said, flicking at the curved tip at top. And with that, Oswald just waddled out into the top floor of the Magic Kingdom. “Wait for me,” Johnny said as he gave chase. “Boy, did I ask for this or what?” Amber said, but then shrugged and ran after the two. Oswald bounded over the bushes and into the public, easy to do with his rabbits feet. He flashed a smile when someone called him by name, happy as ever to have people know him. Even if it involves chanting his nickname and showing that strange index and pinkie salute. Whatever that was, he was sure Johnny’ll clue him in. He’s more used to the modern day. Speaking of The Kid, where is he, oh yeah here he comes. Johnny wasn’t too far behind, vaulting over the same bush and leaping over light poles to catch up, with an occasional “Excuse me, pardon me, hope I didn’t run up your pant leg.” Amber was appearing behind him, looking like one of those Castmember Handlers that were supposed to watch after the characters. And not having an easy time at it, poor girl. That was when Oswald heard a gasp. And with that, Johnny put one hand over his eyes and pretended to tap a cane around. And with that, there were a couple of thuds to Minnie’s right. “Ulp!” Oswald acted as if he didn’t notice that his ears had actually broken off his body and fallen onto the lawn until Minnie reminded him. “It happened again? You’ve gotta excuse me.” He picked up his loose ears and fumbled through reattaching them. “Hey, watch it, pal! You don’t know where that foot’s been.” That came from the other side of the grassy field in a gravel-like and unmistakable voice. “Pluto’s been laying land mines again, see?” Pete (in a security uniform) said as he walked through the crowd in his typical tough guy gait. His left leg tapped the stone border with an audible clack, announcing to the world where the peg leg is. “How did _he_ get out of the Wasteland?” Oswald said pointing to Pete. And with that, Pete threw Johnny right at the returning cartoon character. 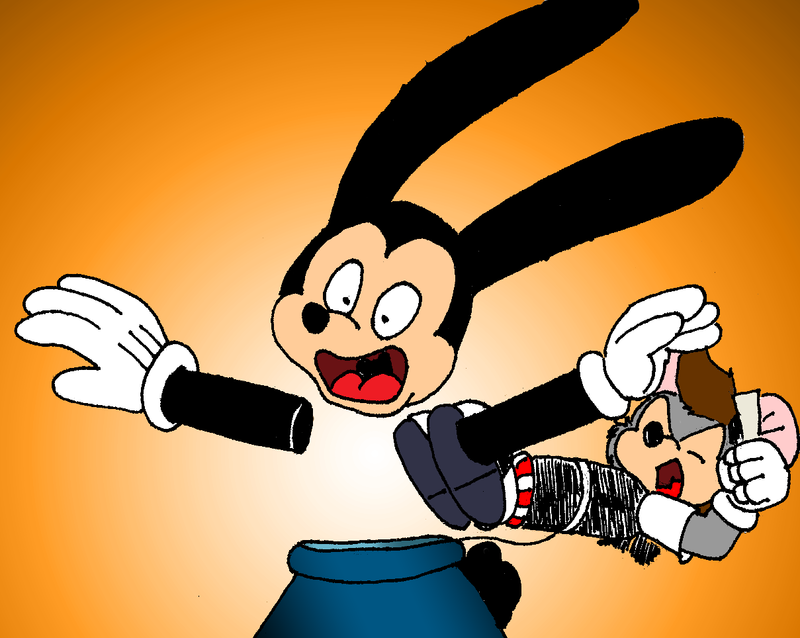 Oswald pretty much shattered on impact, with his head, and all four limbs remaining stationary while Johnny took out the torso. Just then he reached into his back pocket and pulled out a handkerchief…with a price tag still attached to it. And a couple of other security guards, each of them twice the muscle head of Pete, saw it. Johnny got up, sighed, shrugged, and then bounded over to the tackled down Pete. The look on Pete’s face was priceless. So was Oswald’s and his cat friend’s. That only got some concerned looks by some of the castmembers. 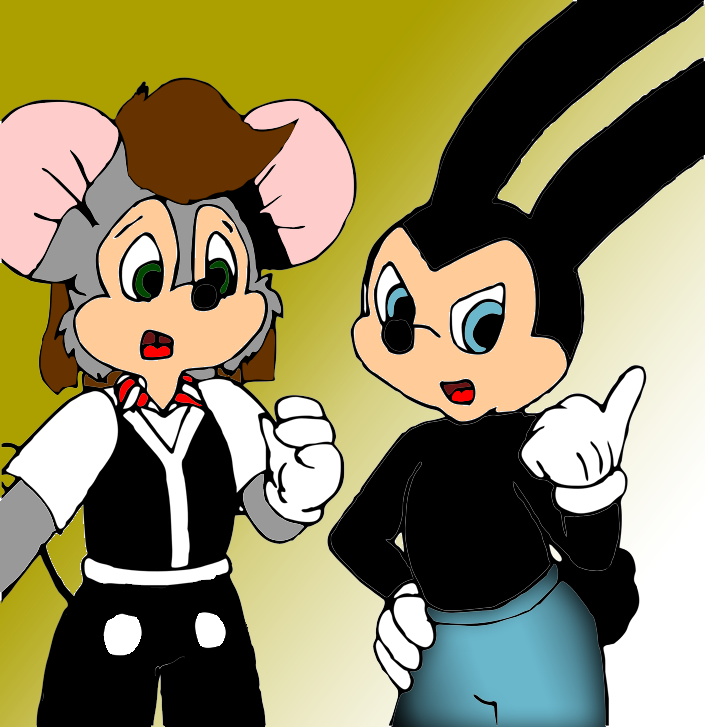 Oswald just muttered about sights he’d rather not see, while Johnny talked about his poor burning retinas. Then Oswald thought of an idea of getting Pete back for this injury: he took the jockstrap and pulled it out further. Just enough for Johnny to slip the receipt under the underwear, which was his intention in the first place. “Ow Owowow!” Pete complained, still on the ground, still pinned by the two security thugs. “I’ll get you for this, Johnny Briz!” He then lowered his head to mutter to the guards. “Just get me outta here so I can properly die of embarrassment, will ya?” He managed to belt out a “Young Punk,” to Johnny as he was carried away. And that’s when Ortensia froze, and froze as in frozen solid. She actually shuddered. “What’s wrong, love?” Oswald said, showing a bit of concern. “That’s just what I was planning to do,” Amber said with a smile, as she guided the three of them out the front gates.